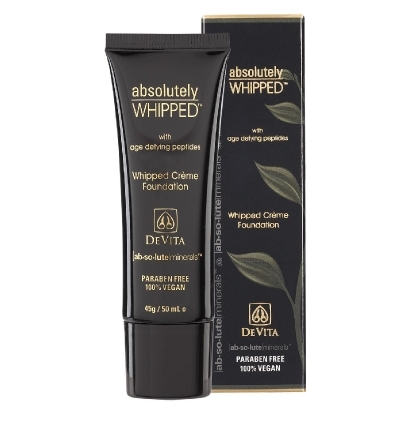 DeVita's absolutely WHIPPED ™ is incredibly light and creamy, blending smoothly to a soft, dewy finish that provides superior coverage, without the heavy masked feeling of other foundations. Our exquisite combination of enlightening pigments, active moisturizers, and age defying ingredients featuring Tripeptide-5, along with organic aloe vera, offers you the first truly unique moisturizing whipped-crème mineral make-up foundation. Just great, healthy coverage you can count on - absolutely... |ab-so-lute| minerals™ by DeVita. INGREDIENTS: Aqua (purified water), Cocos nucifera (certified organic coconut) oil, Buxus chinensis (jojoba) oil, Aloe barbadensis (certified organic aloe vera) gel, Rosa damascena (rose) water, Emulsifying wax NF, stearic acid NF, Kosher vegetable glycerin, Persea gratissima (avocado) oil, Punica granatum (organic pomegranate) fruit extract, Lecithin phospholipid, Polysaccharide (xanthan) gum, Palmitoyl tripeptide-5, Tocopherol (vitamin E), Ascorbyl palmitate, Octanediol, Ethylhexyl glycerine, Citrus Grandis (grapefruit) seed extract, Artemisia princeps (Japanese mugwort) extract. May contain Titanium dioxide, Iron oxides. ACTION: Provides an incredibly light and creamy application experience, which blends smoothly to a soft, dewy finish that gives superior coverage, without the heavy masked feeling of other foundations. Features enlightening pigments, active moisturizers, and age defying Tripeptide-5 in an organic aloe vera base. DIRECTIONS: Over clean, moisturized skin prepped with DeVita’s Prime Corrective, stipple on absolutely WHIPPED™ foundation using a clean foundation brush, flocked sponge or fingertips. For full coverage, stipple entire face starting with nose, cheeks then chin and forehead. Blend and smooth evenly over face, and blend lightly down neck to ensure there are no lines. 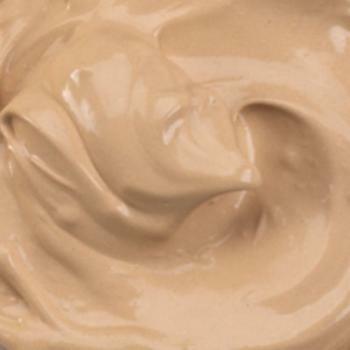 NOTE: Best for medium coverage for those who prefer a whipped creamy style of foundation. Great for all skin types. Excellent for dry skin!